Finished Size 24 ¼ (26 ½ , 29 ¾ , 34 ¼ , 38 ½ , 42 ¾ )" waist circumference and 22 ¾ (22 ¾ , 23, 23 ¼ , 23 ½ , 23 ½ )" long at back; skirt shown measures 24 ¼ " circumference at waist; modeled with ¾ " of negative ease. Or get the whole issue here! 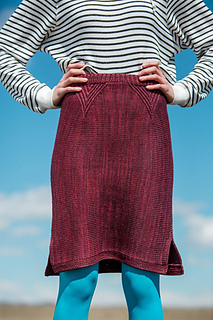 Live comfortably in this side-to- side knitted skirt with an elastic waistband. The slits on the bottom of each side allow for movement, and four slip-stitch triangles along the waist create a nice graphic detail. 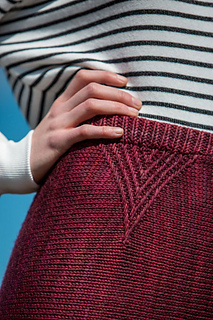 This skirt starts with a provisional cast-on and is grafted at the center back. Finished Size 24 ¼ (26 ½ , 29 ¾ , 34 ¼ , 38 ½ , 42 ¾ )“ waist circumference and 22 ¾ (22 ¾ , 23, 23 ¼ , 23 ½ , 23 ½ )” long at back; skirt shown measures 24 ¼ “ circumference at waist; modeled with ¾ “ of negative ease. Yarn SweetGeorgia Yarns Superwash Worsted (100% superwash merino wool; 200 yd 182 m/4 oz 115 g): terra firma, 5 (5, 5, 6, 6, 7) skeins. Needles Size 6 (4 mm): 24–32” circular (cir) needle, depending on size you are making. Adjust needle size if necessary to obtain the correct gauge. Notions Markers (m); tapestry needle; waste yarn; size 7 (4.5 mm) crochet hook; spare size 6 (4 mm) or smaller cir needle; 1” wide woven non-roll elastic equal in length to waist circumference plus 1”; matching sewing thread. Gauge 20 sts and 29 rows = 4” in St st.